I’ve learned that there actually is some skill (or luck) involved in selecting toys that your feline friends will play with, and that whatever obscure rules seem to define the attributes of the perfect toy defy both my logic and intuition. In the “old days” with Kit and Win, the preferred toy was a rabbit-fur covered plastic mice. They actually used to demolish these toys and would sometimes go so far as to eat the fur covering. I’d frequently find eyes and ears on the floor within hours of giving them the new toys. Later, I’d find a bare plastic shape that had been denuded and dumped in some corner. Over the years I bought bags and bags of these toys, many of which disappeared under the little freestanding refrigerator I had in an old apartment on the top floor of a great Victorian house. When I moved, my friend (the next tenant) — who clearly was a far better housekeeper than I was — pushed the refrigerator out of its habitual spot and then jumped on a chair shrieking loudly. Ah, yes, she had found the cache of toy mice (which really did look like real mice) under the appliance. With my previous group of Midwest kitties, they all seemed to be serious catnip addicts, so any toy with significant amounts of that mint got their attention. One of their favorites was a long tube of fabric that was stuffed with fiberfill and copious amounts of Nepeta cultivars. They’d grab the tube with their front paws and kick it for all they were worth with their back paws while looking slightly loopy and happy. Those cats also were exceptionally fond of a great kitty fishing pole I’d bought. The packing said it was handmade by an out-of-work resident of the Appalachians. It actually has real fishing components (a wooden handle and a fiberglass “rod”) as well as heavy gauge dark-blue cotton yarn for the “string” that terminates in a piece of old denim fabric. They would chase that toy for hours and hours if the human had the energy to play that long. This toy still exists so it clearly was worth the $18 investment I made, although Caesar chewed the string in two one morning when I wasn’t paying enough attention. Among my current crew, the little ones really love wildly colored (fake) fur mice that have something inside that shakes and rattles when the toy moves. Mac almost always chews the tails off these toys within minutes of being given a new one…an action that doesn’t make sense to me as she loves nothing better than flipping the toy in the air for hours and hours, and you’d think that could be done more easily by holding it by the tail. I never quite know where I’ll find one, but that’s a tale for another day. Fireball runs around with them in his mouth and will stop for a drink. Of course, the mouse has to take a dunk in the water bowl too. (So much for the cat whisperer’s assertion that cats don’t want to foul their drinking water with dead prey!) Sometimes he forgets to retrieve his friend when he takes off running again and I find the toy partially delaminating in the water the next day. Unfortunately, both Mac and Fireball tend toward athletic extravagance when they have these toys, which means they very quickly lose them (yet another tale for another day). Now as much as Mac and FB like the wild blues and oranges of the noise-making mice, Caesar (being the more sedate, mature, and conservative member of the clan), favors quiet mice (with no annoying rattle) in more natural (fake) fur colors of grey, black, and white. 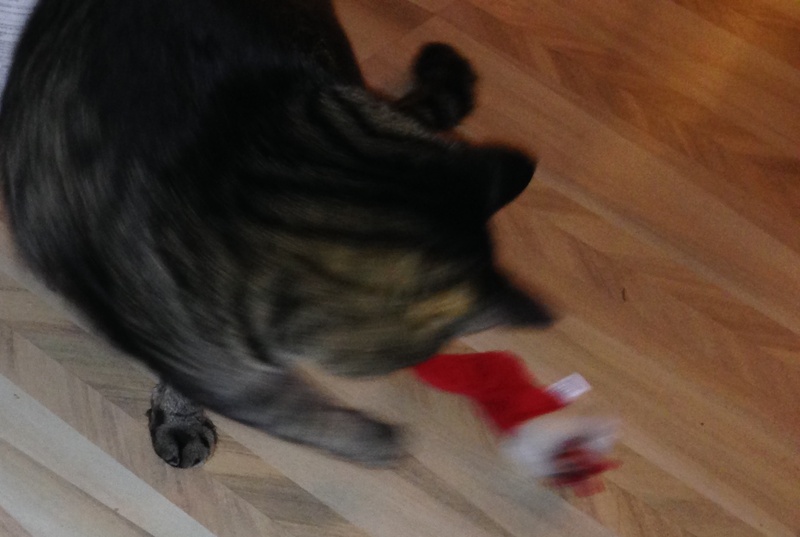 He loves to grab them by the tail and run around with them dangling down his chin while he chirps excitedly. Who says the Big Guy doesn’t let loose and play? Since FB and Mac had lost their last cache of the brightly colored mice a month or so back, and no one seems to like the adorable catnip-filled “fish” toys that Sandy Claws brought them for the holidays, they have been reduced to playing with the same boring mice that Caesar likes. However, I must report that last night and this morning there was great joy and loud chirping all over the house, as the silly human finally took the hint and broke out 2 new “shakey” mice and a bright cord-wrapped soft-chew mouse. They’ve been flinging the toys in the air, running up and down the stairs, and generally carrying on with great exuberance. This likely will only last a few days, as these mice do tend to get lost down air intake ducts quite quickly (to be recovered in late spring when the houseplants all go outside). But at least for now, all 3 of them are having fun. And here is a puzzling update on our household fun with the water bowls — specifically, the downstairs water bowl, since the upstairs one doesn’t suffer the same indignities. I’ve previously explained all about Mac’s fun little game with flooding the floor around the water bowl. She just loves to scoop water out of the bowl with one of her mitts and toss it on the floor. Sometimes she drinks it, but mostly she seems to do it for play (and to annoy the human for some transgression so obscure as to be unaccountable). Not only have I experimented moving the water bowl all over the place, and changing the kind of towels and placemats on which it rests, but I’ve also changed the particular bowl I was using too. After all, I’m trained in the scientific method! When there was no respite to water antics with the heavy ceramic bowl (tinted light blue inside), I tried several sizes of stainless steel bowls with no change. She threw water out of them too. Next I tried a white melamine bowl. Same results. After that, I tried a clear-glass bowl, figuring that would really confuse her. Sure enough, I did get to see her sticking one, then the other front leg around the outside circumference of the bowl, grasping at air beyond. I think the completely clear bowl really messed with her head. (Does that count as 1 point for the human?) Regardless, I paid for my momentary victory as water once again was transported outside the bowl and dumped onto the floor. Just when I was giving up on ever having a dry floor again, I tried a bowl I hadn’t used before: a transparent cobalt-blue glass one. Hmm, it’s been a week and no water has been flung onto the floor (despite the bowl’s immediate proximity to the crunchies bowl and the fact that it sits without benefit of a towel on the placemat). I almost don’t know what to do with myself. What was the secret? It’s not that the shape of this bowl is so different from the white melamine and clear glass ones, although they all are more slanted than the original heavy ceramic bowl and larger than the stainless steel ones. Clearly color is an issue, at least with transparent bowls. But what is it about the cobalt color? Does it represent “water” to her more than another color? Or is she messing with my head and just giving the game a rest for a bit until I let down my guard? Hmm, cats. Can’t live without them, but can’t always live sanely with them either. Bah! You should see (cat) breakfast in my house in the morning. 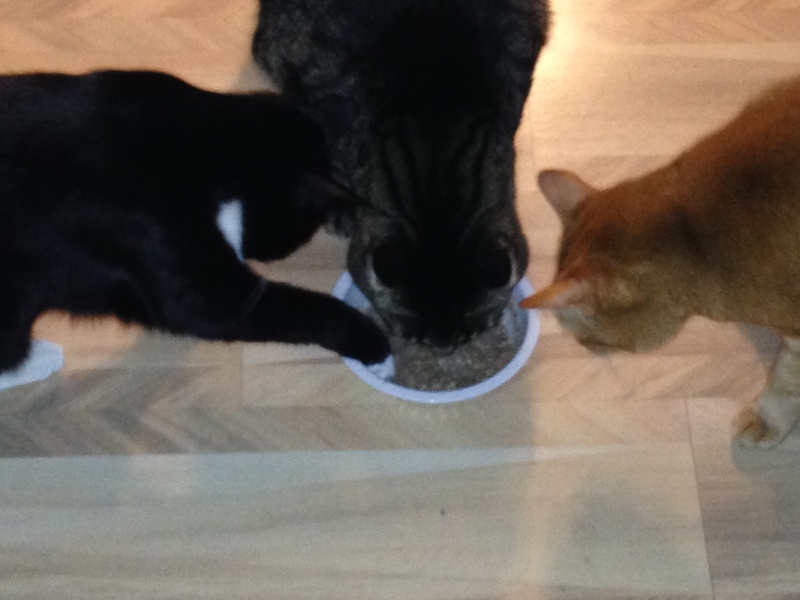 I’ve learned that regardless of whether I put their soft food in 3 bowls or 1, they all eat out of the same bowl. Since I’m a practical human, I now use a single bowl. 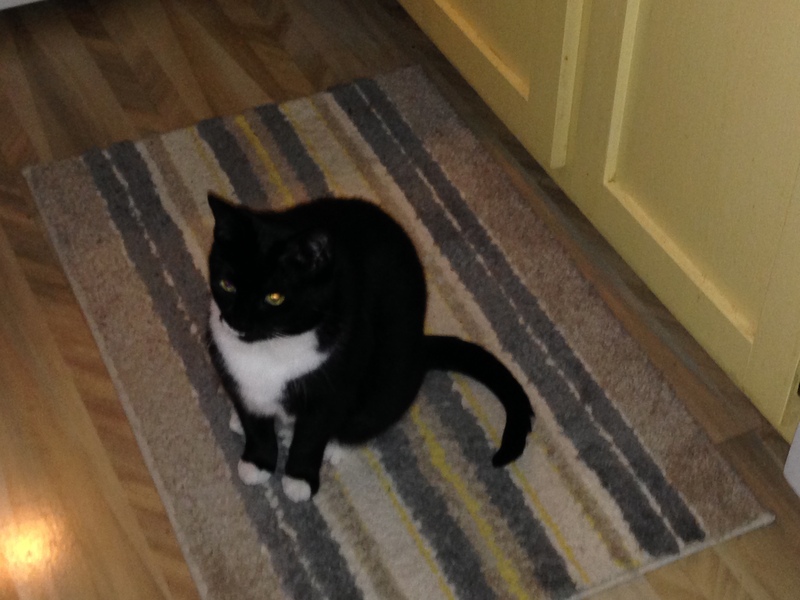 Once it’s on the floor, Caesar hunkers down and starts eating (like a normal cat). Fireball, usually positioned opposite or to the side of Caesar, puts a foot in the bowl and pulls it out from under Caesar’s mouth, sliding the food under his own mouth, where he starts eating. Macaroni does the same thing to Fireball. By then Caesar has walked a few inches forward and hunkered over the bowl again. I laugh myself silly most mornings watching the food bowl move all around the kitchen floor as each one tries to pull it out from under the others to get a mouthful. Of course, if I go back to 3 bowls, they still eat out of 1. They’re so entertaining. Picture this: I have identical heavy, thick-walled glazed ceramic water bowls for the cats on my first and second floors. The glaze on the inside is even blue. And, no, my darlings do not drink nasty city water. They sip only water that has been gently filtered to remove chlorine, fluorine, and other contaminants. For the better part of a year, this worked quite fine. But for some reason, over the past few months, that mischievous girl of mine has started throwing copious amounts of water onto the floor from the downstairs water bowl…often looking over her shoulder to make sure she has an audience…and not just once a day. No, she’ll sometimes flood the floor 3-4x in a row. I no more than get the last flood dried up, the bowl refilled and placed on a dry towel that, in turn, sits on a plastic placemat, then off she goes again. I find it quite interesting that this never happens upstairs, despite the fact that the bowls are virtually identical and the water comes from the same filtered source. In fact, for reasons I don’t understand, they hardly ever drink water up there at all, despite the fact that there is a small bowl of crunchies out. I probably should back up and explain that Mac(aroni), my tuxedo female, generally can’t be bothered to crouch down and eat or drink like a normal cat. 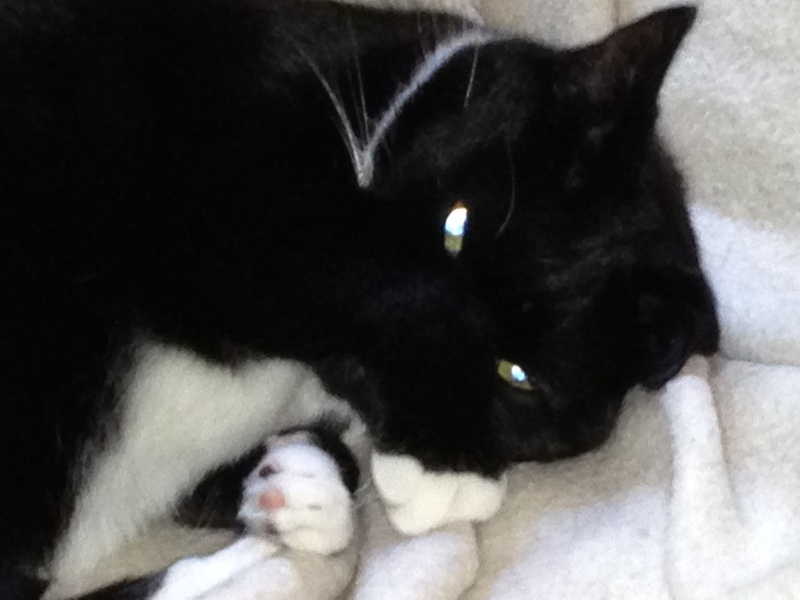 Instead, she’s more likely to sit up and snake a paw into food or water bowls and eat off her mitt. Her latest variation on the theme of floor flooding is to scoop water out of the bowl and then crouch down and lick water as it beads up on the towel on which the bowl sits. Stay tuned: I’m sure there will be more. We’ve had remarkable cold and snow here in the last week. Of course, the weather changes have brought along “snow sillies,” with the cats racing up and down the stairs playing tag and dragging their toys all over the house. The weather also seems to have gotten them to “talk” more and be more vocal. This morning, even (normally quiet) Caesar is getting into the spirit of things. 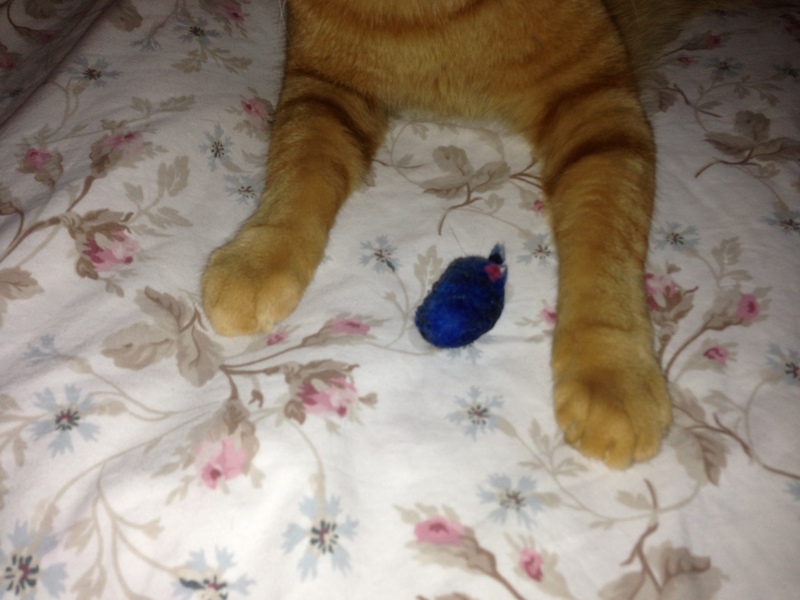 He has a toy mouse he seems to have “captured” and is running around the house calling out about his latest conquest. It’s times like this that I really wish I understood what they were saying. Is he calling the rest of us in to see his “kill,” is he crying out in joy and play — the cat equivalent to a boisterous belly laugh — is he inviting his fellow meows to the hunt? Over the past nearly 2 years, it’s been wonderful watching their personalities unwind from that terribly guarded state they arrived in and to hear them start to talk. All of my previous cats have been quite vocal with me, so I’m glad this group is finally feeling comfortable enough to do the same. One of the highlights of my days is during “breakfast” when they are trying to hurry the slow human along and help her focus on feeding THEM. They set off this chorus of chirps and other little sounds while sitting nearby and staring intently at me. Each one of them has a slightly different pitch to their cries, and it’s so much fun listening to them talking while they remind me about what my focus should be at that moment.